A magnificent bridge over the Okavango River in the Mohembo Village area which is being piled by Keller’s Franki Africa for main contractor Itinera/Cimolai JV, is a shining example of Franki’s diverse strengths. Here we focus on Franki’s renowned ability to deliver in remote and challenging environments. The bridge, which connects villages on the east of the river with the rest of the country, straddles the Mohembo East (Kauxwi) Ferry landing site with the Mohembo West (Shakawe) Ferry landing site. According to Devendra Lalbasanth, Franki senior contracts manager, the 1,2km bridge, which consists of two towers for the Cable Stayed portion and 18 piers, requires 189 no. 1200 diameter, permanently cased auger piles at an average of 35m below platform level. Some of the piles required are being installed to a depth of 50m. In terms of the ground conditions, the top 12m consists of alluvial deposits underlain by soft rock, schists and gneisses – metamorphic rock developed from basement granites – and there were no surprises in this regard as the Botswana Roads Authority’s geotechnical investigation, prior to and post the award of the contract, was thorough. Lalbasanth says that, on the face of it, the scope of works may sound like a fairly straightforward task in geotechnical terms but the nature of the site and the surrounding area, including roads and general access, were extremely challenging especially for bringing in the specialised equipment that was required to do the job.” Lalbasanth says. And it was no ordinary equipment that had to be transported to the site. 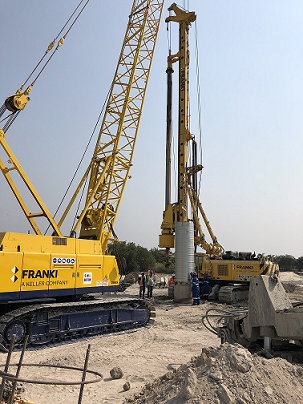 It included a Liebherr 355 – one of the largest augering machines in Africa – two Casagrande B180s, a Bauer BG 18 and two Liebherr 845 service cranes. “Getting this equipment to site was certainly the greatest challenge facing the Franki team. For example, before this job the Liebherr 355 was doing rigid inclusions at Clairwood Logistics Park in Durban and we converted it to an auger configuration before transporting it to Mohembo, 1500km away,” Lalbasanth says. Meanwhile Errol Braithwaite, Franki MD, says that he is proud of the quality projects that Franki is currently involved in, especially in this very challenging economic climate. “There is no doubt that the construction industry in Southern Africa is facing one of the most pressured periods in its history – many companies are having to reinvent their business models, some will close, foreign companies are entering the market, skills are exiting the market and confidence is down. Braithwaite says that another important competitive advantage of being part of the Keller group is that Franki has been able to bring world-class technology to the African market: the rigid inclusion ground improvement technique to the Clairwood Logistics Park in Durban, large diameter cluster hammers to the Hass Towers project in Nairobi and deep cased augers socketed into bedrock to the Okavango River Bridge in Botswana, which is discussed above. “Indeed, there is much more that will help us to continue providing our customers with the appropriate solutions at the right price,” says Braithwaite. “This includes simplified, standardised business processes, LEAN construction and data analytics, which, along with an obsession with skills development, will underpin our continued success on this continent. Franki has always been a values driven company and its successful integration into the Keller organisation is undoubtedly, in large part, a result of the shared value system of both companies which can be summarised as follows: Integrity: Consistently acting with honesty, fairness and positive intent; Collaboration: There is a huge amount of collaboration required to take a job to fruition, both internally and with our customers, suppliers and counterparts. Good relationships and mutual respect are foundational; Excellence: Excellence is the application of skill and diligence in the delivery of every project. It is the mindset of: We can and must continue to get better. We can never be satisfied with the status quo. Franki Africa has a long history of success on the African continent and its experience and expertise have been greatly bolstered by being part of Keller with which it shares all the values that will enable Franki to continue giving its clients a world class service. “We are fortunate to have some of the best people, technologies and equipment on the continent and it is our responsibility to continue delivering excellence across the board to all our customers,” Braithwaite says. He adds that perhaps Franki’s most important attribute is the quality of customers it has attracted over the years. “This has been a privilege of the highest order and I am pleased to be able to express our gratitude to them out loud and in public,” he concludes.